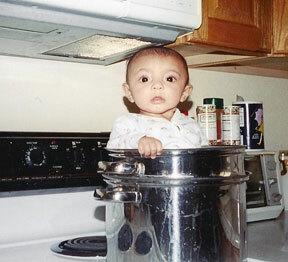 For someone who writes about food and enjoys cooking, I really don’t own many fancy or specialized kitchen tools. I keep things pretty basic. I do own a Kitchen Aid stand mixer (strange, since I don’t bake) but that was a wedding gift from an aunt. I own a food processor, but I inherited that from a friend after she decided to purchase a fancier one. The only really specialized things I own are my immersion blender and my slow cooker. What is a spiralizer, you ask? A spiralizer is a funny looking gadget with funny looking blades which basically takes any food (namely, fruits and vegetables) you put in it and turns it into long, spiral, noodle-like strands. That’s it. That’s the only thing this gadget does; it’s totally useless for any other purpose except making spiral-looking food. Why on Earth would I waste my cash and my pantry space on such a ridiculous piece of equipment? Have I lost my marbles? Well, the jury’s still out on the marbles, but the reason I felt the need for a spiralizer is so I can make Zoodles. Zoodles are “noodles” made out of zucchini. I can’t remember where I heard about them, but the purpose of zoodles are to trick yourself into thinking you’re eating pasta when you’re actually eating zucchini ribbons. I know, I know, it’s a stupid idea! But here’s the thing. When it comes to die-hard, vicious, foam-at-the-mouth cravings, pasta is tops on my list (right next to French fries and guacamole with chips). I love the stuff, I want the stuff, I need the stuff. My thighs don’t love the stuff so much. Face it, frequent pasta dinners aren’t the best thing for the old figure, especially if, like me, once you start eating a plate of pasta you cannot stop eating it until you’ve just about eaten yourself sick. I fork that stuff down my gullet like a starving mongrel dog. It’s not ladylike, not one bit. So what’s a pasta-craving girl to do when she’s trying to watch her calories? She goes online like a fool and orders a spiralizer. Now, longtime readers take heart–I’m still a pasta eating girl and always will be. Zoodles will never replace noodles, because let’s face it, zucchini ain’t pasta. Even spiralized into noodlish strands, zucchini is, at best, a fairly poor substitute. I know some die-hard dieters who down an entire plate of zucchini noodles with clam sauce and call it dinner, but that’s not me. What I’m using my spiralizer for is to stretch my plate of pasta farther, so I can eat more of it. Or at least trick myself into believing I’m eating more pasta. I’m unhappy when I have to limit myself to a mere cup of pasta on my plate. It looks paltry and it feels stingy. Stingy pasta stinks! When I tuck into a plate of linguine, I want abondanza! So how do I get abondanza without getting enormous in the process? I replace half of the pasta on my plate with Zoodles. I still get my cup of pasta bliss, but I also get an entire extra cup of food on my plate, in Zoodle form. That’s a pretty good deal. I’d seen a Zoodle recipe on one of my favorite blogs, White on Rice Couple (you guys do follow Todd and Diane, right? They are amazing photographers and cooks and human beings. I adore them. You really should follow them). Todd and Diane came up with a recipe for pad thai using Zoodles, and it looked delicious (although with their mad photography skills, they could make a plate of poo look tempting). Asian noodle dishes are among my most favorite things on the planet. In my dreams, I eat huge piles of pad thai and peanut noodles and bun bao. Me lovva my Asian noodles. Todd and Diane made their pad thai with strictly Zoodles, and I admire their virtuous souls, but I still wanted my noodles. So I adapted their recipe, adding prepped and soaked rice noodles to the stir-fry step of the recipe. The result was delicious and satisfying and yielded a very generous amount of food on the plate, which made my gluttonous soul happy. Todd and Diane gave very specific instructions for cooking the Zoodles, and I’m glad they did, because otherwise, the Zoodles would have been watery and less than stellar, so pay attention to their instructions to stir fry the Zoodles and then let them rest in the pan for a few minutes. That resting time allows them to release excess water–and they will. Once they’ve rested, you drain your Zoodles and proceed with the recipe. Nobody wants soggy Zoodles and diluted sauce, right? So yes, readers, I am the silly girl who ordered herself a goofy spiralizer thingy because she has a noodle addiction. And a silly preoccupation with the size of her backside. I’m weird and vain and hungry. Combine all of the sauce ingredients in a small bowl and set aside. Using a mandoline, vegetable peeler or a spiralizer, make zucchini ribbons. Set aside. In a bowl of very warm water, soak the rice noodles for 10-15 minutes or until softened. Drain and set aside. In a large wok or skillet, heat 1 tablespoon oil over medium high heat. Add the zucchini noodles and cook for 2-3 minutes or until just crisp-tender. Take the pan off the heat and let noodles sit for about 3 more minutes or until they release some of their excess moisture. Drain the noodles and set aside. Wipe out the wok or skillet and heat the remaining tablespoon oil. Cook the garlic for a couple of minutes, being careful not to burn it. If using a raw protein like chicken or shrimp, add it and stir fry until just done. Add bell pepper slices and scallions, cook 2 minutes. Add beaten egg and cook through. Add zucchini noodles and softened rice noodles and stir fry for a minute or so. Add bean sprouts and the sauce mixture and toss, cooking another minute or two more. Serve garnished with the peanuts and chopped herbs. Zucchini in my Pad Thai? I wonder if my favorite Thai restaurant has a spiralizer. I might ask them to give it a try. Looks good. “Zucchini ain’t pasta.” Amen to that. Although, I have to say that this tool makes me wish that I didn’t find all things squash abhorrent. Oh, me. Oh, my. That looks delicious. I’ll be making this tonight! I have eaten zucchini noodles at our local pho joint — they work wonders as a noodle replacement! I’ve just never attempted to make them at home because I am lazy like that. But maybe I should commit — my pancreas does not love my pasta love. The most ridiculous kitchen gadget I have ever owned? Maybe it’s our grill. Which is technically not in the kitchen. But we do more cooking on that thing each week than on any other appliance, and it’s entirely because we are major protein eaters by necessity. Smoked pulled pork shoulder, sirloin tip, whole turkeys … I have forgotten how to do meat in my oven, thanks to the Big Green Egg. 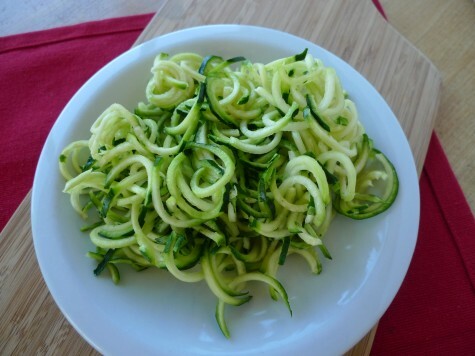 I am fascinated with the spiralizer, though I can’t imagine eating an entire zucchini as a meal. Your NooZoodle Pad Thai looks yum! 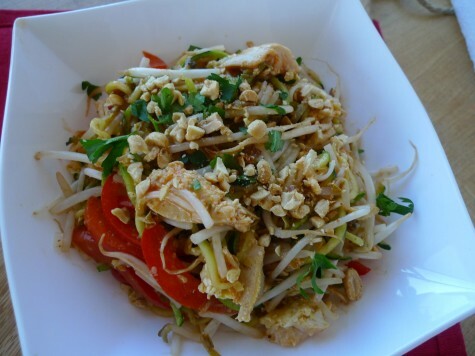 I love pad thai and cannot wait to try this recipe. Thanks, Kitch! Have fun with your spiralizer. Truthfully, I loathe the word “zoodle.” I think it’s a silly word and I think most of my annoyance comes from seeing my Pinterest board littered with recipes for them as a complete replacement for pasta. OMG, I have too many gadgets to count, my husband used to get so mad at me when I brought home something else for the kitchen.